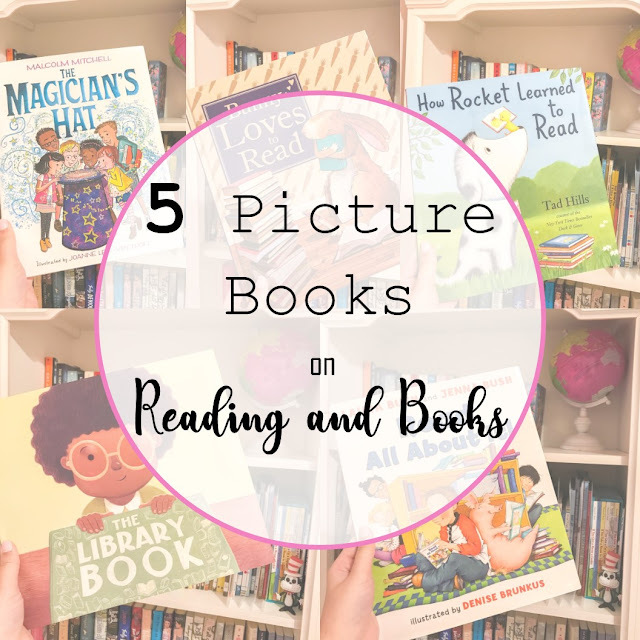 Juliana Grace Blog Space: 5 Picture Books About Reading and Books! 5 Picture Books About Reading and Books! Hi teachers! I am so happy you're here. If you came here from my teaching Instagram, welcome. This is my blog where I have been sharing all things fashion, lifestyle, and books for several years. I have recently decided to share my picture book posts on here as well so that you can easily shop my favorite picture books. For those of you who don't know, I am a college student studying Special Education and am currently an online ESL teacher to students in China. I LOVE what I study and LOVE what I do right now. I also LOVE picture books and using them to teach a variety of different skills. They are also just fun and entertaining. I have always been quite a book nerd myself. Inspiring students to read and learn through books is a huge passion of mine. If you aren't following along on my teaching Instagram, go ahead and pop over there to see what other books I have shared thus far. Today we are talking picture books about books... weird right? I love these books and couldn't wait to share them with you today because they can really help students find motivation to read and also learn what magic a book truly holds. Let's get to it! I'm just going to go ahead and say that this has to be one of my favorite picture books of all time. This book is actually meant to be a song that you sing to (found here). The illustrations are adorable (um hello, I love this characters hair), and the song will get stuck in your head for days. Your kids will love singing this along with you time after time. I love this sweet book about a dog who really wants to know how to read but finds it just too difficult. It is great for struggling readers to listen to and is so cute. The little bird shows the dog that reading is simple and can be learned little by little. This book by Laura Bush and Jenna Bush Hager is a favorite. It shows what great imagination you can have when you read a good book. The students in this book don't like to read until a special guest reader comes to their class and the characters come to life. This is such a cute read. This book is about a rabbit who's friends are always wanting to play and make fun of Bunny because he just wants to read. Well, once the friends decide to join in on the reading, Bunny can't tear them away from their books. Once they all do go outside to play, they decide to act out the books they read. This is a great example of how much more fun you can have playing when you read creative books. This book is a recent favorite. This is about a magician who "knows the magical power of books, which can explore dreams and develop creativity". This one has beautiful illustrations and is a lot of fun. Do you have these books? Are there any that I'm missing? I will talk to you soon and will be sharing five more books next week.